Download the Sapphire Scrapbook Video Tutorials and begin making four beautiful, creative projectsjust twenty minutes from now. It's easy to make unique and charming projects when you follow these easy, step-by-step demonstrations. 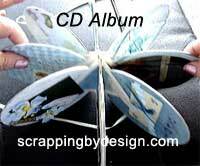 This adorable CD album is made entirely from CD or DVD disks and paper. Use as many or as few disks as you want. The one in the project uses nine. I have decorated it in a baby theme, but you can use any theme and color scheme that appeals to you. This one is truly adorable. Show it around to friends and you'll be getting inquiries about custom orders in no time. I do. This modern and stylish gateway album opens up to display your precious memories, or folds up neatly and ties with ribbon when you're not showing it off to friends. Inside this mini album, "gates" open and close to display or hide your photos and journaling. When decorated with your favorite embellishments, this album is utterly charming. Decorated both inside and out, this wonderful masculine themed project is a great gift for dad or for the man in your life. 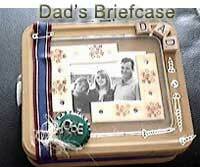 Made from a tin box (such as the ones containing chipboard embellishments or a small tin lunch kit), the "briefcase" opens to display photographs, journaling and a number of man-friendly embellishments. Created from an old cigar box purchased at a tobacco shop, this heritage themed album opens to display six appropriately decorated pages removed from a children's board book. Naturally, you can make this project using any theme or style you want, but it lends itself admirably to family heritage photos. I was inspired from your video "Briefcase Box." Thank you for the help on a project for my husbands birthday celebration. I was inspired from your video "Briefcase Box." I made a "briefcase box" decorated with fishing items that I found around the garage. I put years of photos of the many fishing trips with the family that we had done, that were sitting in the closet. Everyone at the party enjoyed reminiscing. I found that the video was clear and well done and were easy to follow. Just like you mentioned in the video you can find much what you need by looking round your home." Cost: Affordably priced at less than you pay to attend even one workshop, you receive video tutorials for four complete projects - PLUS a free bonus gift! You will download an introductory video plus four videos demonstrating the products mentioned above. You will receive a supply list outining the supplies you will need for each project. Additionally, you will receive a bonus thank you gift. It's a surprise... but you'll like it! The video files are in Quicktime format. You play them with the freeQuicktime Playermade by Apple. The surprise bonus plays in Windows Media Player. Why are they Called Sapphire? Because I plan on making a series of scrapbooking video tutorials, and each will be named for a different gemstone. Sapphire is the first video but not the last. P.S. Remember the free surprise bonus! It's probably not what you're expecting, but you may end up thinking that its the best gift you've ever received.